I want to make sure that we are including some homeland natural security issues every now and again here at the Natural Security Blog. I also wanted to read something semi-fictitious other than comic strips this summer. 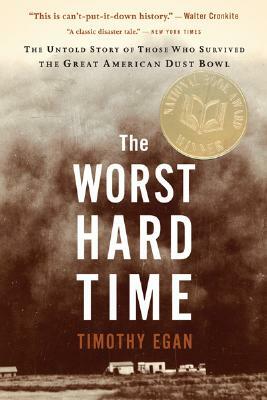 For this I chose The Worst Hard Time: The Untold Story of Those Who Survived the Great American Dust Bowl by New York Times writer Timothy Egan. As the book described it thusly: “John Steinbeck gave voice to those who fled the Dust Bowl in his masterpiece The Grapes of Wrath. This is the story of those who stayed and survived.” The joke was on me. I was deceived by the comparison to Grapes, but this book is cold, hard nonfiction. Egan’s account walks the reader through the gray, grisly details of the Dust Bowl of the 1930s. In one of the (if not the) worst natural episodes in the country’s history, the author details both the human role in creating the ecological tragedy, and the human reaction to it. The Dust Bowl was in part severe, extended drought, and in part the results of abuse of the land by Americans expanding into some of the last unsettled regions of the country and attempting a dramatic and poorly planned ramp-up in agricultural production of crops not endemic to the region. The manmade environmental devastation to parts of Oklahoma, Texas, and surrounding states was in response to very attractive prices as well as irresponsible federal homesteading policies and fraudulent marketing on behalf of a few companies. In fact, many of the factors contributing to the human side of the Dust Bowl are ingredients that today we look for in unstable countries abroad as we monitor world economic, political, and natural trends. While The Worst Hard Time provides details as to the causes of the Dust Bowl, its utility for the work we do here stems more from its detailed excavation of what the physical effects were and how the Americans most affected by the natural tragedy reacted. In looking at issues of land management and climate change, many of our questions to our scientist collaborators always come down to these factors: what do natural effects look like on the ground, and how will people respond? In this case, many people fled. But many people also stayed, enduring the wrath of the environment, extreme poverty, ill health, and, at times, starvation. Egan details the thought processes of those who struggled rather than migrating in ways that enlighten what thinking we might expect from people in currently unstable and environmentally ravaged places. Migration from some areas of Africa into Europe at unprecedented rates is an often-projected effect of climate change that could have destabilizing consequences in both places. The decisions to stay or go for the Americans portrayed in Egan’s book involved many factors of course, but chief among these questions: what are the economic and social prospects elsewhere; will I be ostracized in other lands; what are my familial ties to my current location; and does migrating equate to a decision to abandon whatever hope for the future I once had? With these questions in mind, many who decided to endure the Dust Bowl chose the extreme hardship and even a likely premature death, and this is instructive in thinking of the human effects of future environmental problems. As we all know from stories of parents and grandparents, it is not too long ago that it was more common even in the developed world to go without multiple pairs of shoes and clothing, consistent electricity, and three square meals per day. (Of course, close to 40 million people in this country still struggle beneath the poverty line.) This book reminds the reader that the affluence that shapes how we view the world and react to it is very, very new. U.S. security analysts, including me and my colleagues, often ponder the ways in which the rapidly changing rest-of-the-world is changing, but less often relate it to the pace of American change in the past 70 to 80 (or even 20 to 30) years. What we know as security, especially what we now call homeland security, is in turn equally dynamic and will continue to change at a rapid pace. American analysts are going through a new wave of reviewing how economic conditions affect security, just as President Roosevelt declared of his domestic economic policy decisions during the Dust Bowl: “We endanger our democracy if we allow the Great Plains, or any other section of the country, to become an economic desert.” Just as now energy and climate change bills in Congress are touted as job-creators to a far greater extent than they are treated as security measures, in FDR’s time conservation and environment programs were also hooked to economic stability. The back cover of this paperback states: “In an era that promises ever-greater natural disasters, The Worst Hard Time is a powerful cautionary tale about the dangers of trifling with nature.” This book does, indeed, provide a stark warning against man screwing with nature too much. We can’t always bounce back, and we suffer the effects of our own actions.